As the days grow longer the sun brings its brightness and warmth, providing us with the energy we need to recognise and relish the joy in our lives. Often as Mums we get so used to thinking about everyone else we forget to think about us. The real us. Have you given the real you much time recently? Have you taken time to do what you really ‘want’ or are you spending your time doing what you think you ‘should’ do? Springtime reminds us that life gives each of us the chance to flourish. It brings flowers all around us. We watch as year after year they push through the ground to surface and hold their heads up to the light. Provided they are nourished with what they need, they blossom. They blossom into what they were always meant to be. And they are beautiful. Just as they are. Are you getting what you need to flourish? To grow and blossom into the wonderful you that deep inside you know you want to be? Or are you rushing around thinking about everyone else all the time? On what you need to do for them? For most of us Mums, it’s often the latter. Despite knowing that we need to be at our best to keep the balance at home we still put everyone else first. In fact, we even feel guilty about thinking otherwise. This is crazy. It’s a scientific fact that to be our best selves, we need to be relaxed and feel good. How we feel affects what we do and the reactions we attract from those around us. 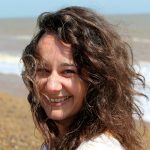 I often tell my clients that life as a mum is a bit like being on a plane that’s about to crash – you can’t help anyone else unless you have your oxygen mask on first. And more than that, you need to be clearheaded enough to put it on properly, keep everyone else calm and demonstrate how fun sliding into the sea can be as you jump into the unknown. What’s the best way to be that clear headed, that motivated? It’s to be in the right state. Calm, happy, confident and in the moment. A great exercise to help you reflect on where you are and where you might like to make some changes to help you be at your best is using the wheel of life. The traditional Buddhist wheel of life was used to help ordinary people understand the Buddhist teachings about birth, re-birth and existence so perfect for Spring. It is called the Bhavachakra with Bhava referring to “emotion, sentiment, state of body or mind, disposition,” and chakra meaning “wheel” which recognises the cyclical nature of living. In coaching we use a simplified version that helps people create more balance and bring more joy into their lives. So why not carve out some time for you this Easter holiday to see what ideas you can have that could make your soul sing? To create your own wheel of life, draw a circle on a piece of paper and divide it into 8 segments that are meaningful to you. I often use the following as balance across these aspects generally leads to a greater sense of wellbeing: Family & Friends, Romance (significant other), Career, Money, Personal Growth, Fun & Recreation, Health and Physical Environment. Take each segment in turn and visualise what your ideal life would be like if that aspect were as fulfilling as it could be. Have fun with it, what do you dream of? If you’re feeling creative, you can even draw a picture! Next using a scale of 0 to 10, where 10 is fully satisfied (your living the dream!) and 0 is not satisfied at all draw a line in each section to show how satisfied you are with that area of your life right now. 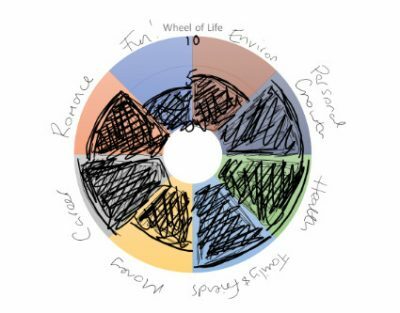 Complete this for the whole of the wheel, shade the area beneath each line, then sit back and notice what you feel as you look at your life from this perspective. Consider if this were the wheel on your bicycle, how confident would you be to take a seat on the saddle? How far would your bike take you? Would it be a comfortable ride or a bit bumpy, especially when the road gets rocky! Finally, with balance in mind, write down the 1-3 actions you could take in the next week or so to make it a better. This might be an action in one specific area or across a few. What’s important is that you are committed to act and you can picture the positive difference this will make for you. The real you. Remember. The wheel of life is a snapshot in time and, as we all know, nothing stays the same, so this picture will naturally shift like the seasons. You’re not aiming for perfect 10’s all around here; you’re aiming to enjoy the ride!